Like nearly every other MOTUC figure, King He-Man largely features heavily reused parts. Other than the head, waist armor and his removable chest armor with attached cape, the figure is all reused parts. The body is the basic human MOTUC body with the boots that were used on He-Ro. While sometimes collectors get tired of reuse, all the parts reused here make sense as they're basic body parts and they give a visual consistency and size consistency to the line. Besides, with the cool new armor and accessories and a very well done head sculpt, it's not like you're going to be confusing him with other figures on your shelf. 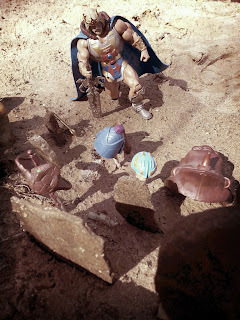 King He-Man has the same articulation as the standard MOTUC figure: hinged ankles, boot swivels, hinged knees, ball jointed hips, a waist swivel, an ab hinge, peg/hinge ball jointed shoulders, bicep swivels, elbow hinges, wrist swivels, and a ball jointed head. I still think that Mattel's MOTUC figure is one of the most solid and well articulated figures on the market. I have no articulation issues with him whatsoever. Good QC, too! While I've mentioned that the sculpt consists of mostly reused pieces, the newly sculpted armor, waist piece, and head really bring the figure together. While the figure is very visually He-Man, the various details and armor tie him in visually with other characters such as King Randor, King Grayskull, and He-Ro. The He-Ro boots and waist piece certainly give him a link to He-Ro, the original wielder of the Power Sword.  The waist armor has a stylized emblem that resembles an "H," similar to but different from He-Ro's logo. The armor very much reminds me of the armor from the first release of King Randor. It's fitting for He-Man, however, as while it has the ornate stylized cross, it also looks very battle ready, in some ways resembling the armor of Battle Armor He-Man. Unlike many of the armored figures, Mattel has chosen to give King He-Man the "muscled" abdominal piece rather than the flat, armored piece. This looks fine when displayed both with and without armor. The cape is not intended to be removed from the armor (although it is only glued on and many fans have removed it) but it looks good and has a fur collar on it. The head sculpt has been the source of a great deal of discussion. Some fans don't think it looks like the MOTUC He-Man head sculpt. I find it hard to judge that considering that A.) This is a much older He-Man and B.) Most of his face is covered by his beard. 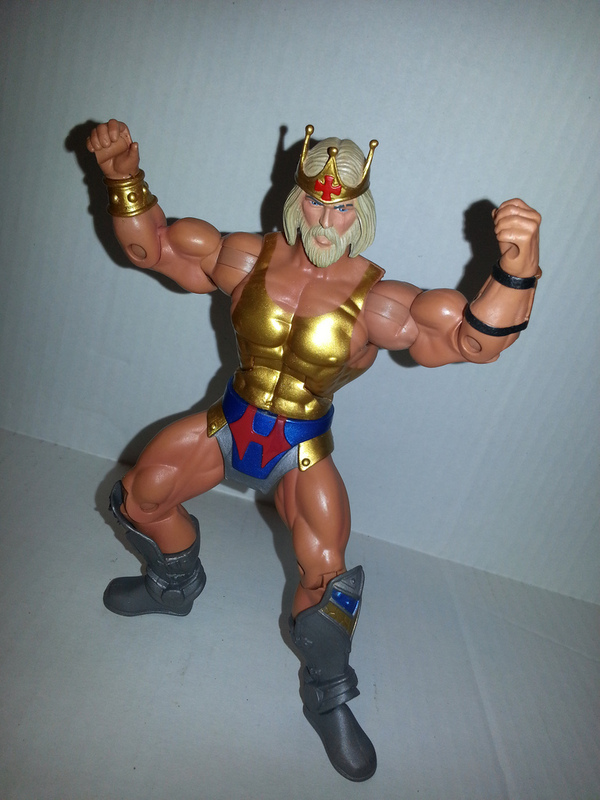 He-Man looks like a regal ruler, wearing a crown not too disimilar to that of his father, King Randor. It's not overly ornate, but fits He-Man's personality. The hair is nicely sculpted and is reminescent of He-Man's iconic hairdo, but a bit less youthful. There is a scar over his left eye, a neat detail that hints at the long journey He-Man has taken to get to where he is now. Another point of contention with the head sculpt is that some fans think it looks like the left lip is drooping. It's been suggested that this was an error, but I can't help but wonder if it was an attempt at giving He-Man some type of expression. I don't think it's very noticeable at all and overall I'm really pleased with the head sculpt. King He-Man, ready to rumble! The paint work is nice and clean overall for the most part, although there does seem to be a bit of too thick paint on He-Man's abdomen. There's also the potential for the bottom of his armor to rub against the paint here, so be careful. Since the abdomen had to be painted gold due to the short armor, Mattel chose to paint He-Man's upper chest gold as well. It gives the unarmored He-Man a gold tank top which looks a little silly, but it far better than having a figure with just a gold stomach. The quality of the paint work isn't the issue here, but perhaps it's the colors themselves. He-Man is a very "busy" figure in terms of the number of different colors on his armor. I personally think he might have looked better with a red cape, rather than blue, but I'm willing to let it pass as busy isn't necesarilly the worst think for a royal figure. Their outfits are designed to stand out, and He-Man stands out well. 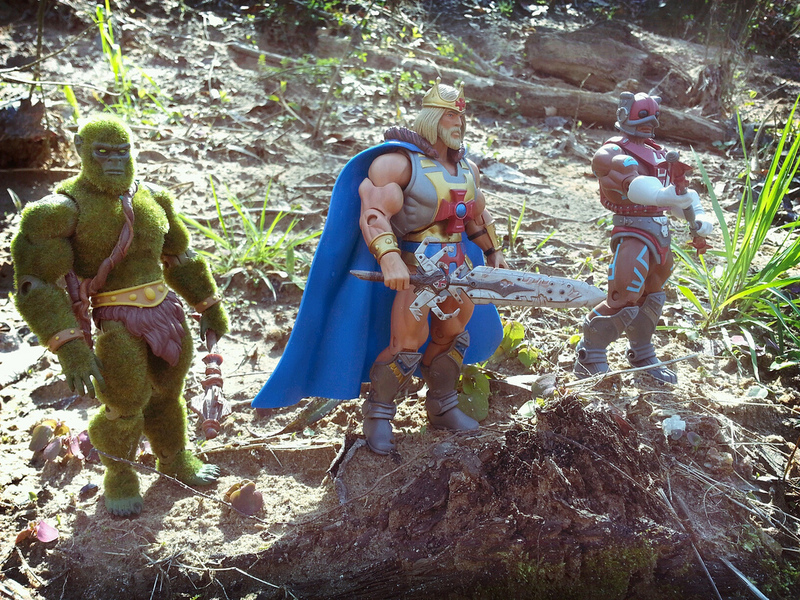 Besides his removable armor/cape piece, He-Man comes with two accessories. The first is a royal staff. It's gold, with a res, silver, and blue ornamentation on top. 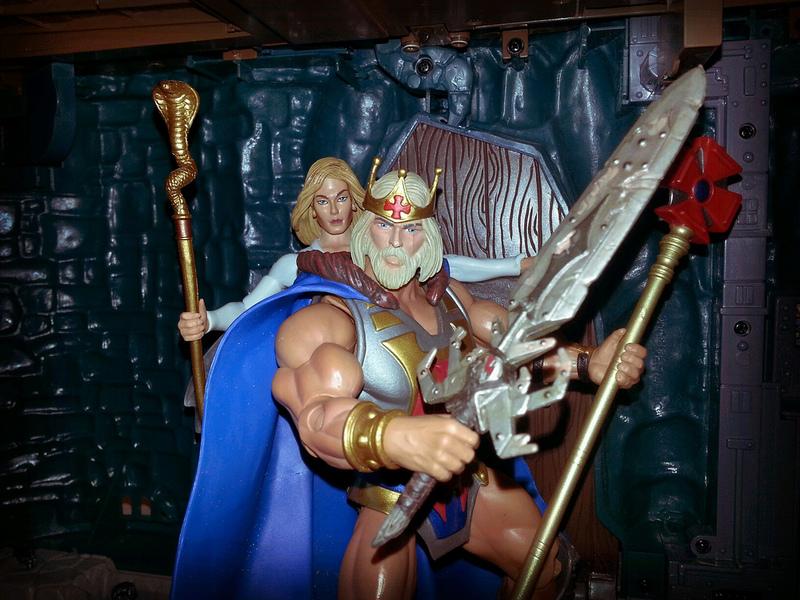 Once again, it is very reminescent of the staff that came with the first Randor figure and Queen Marlena in MOTUC. It's an excellent accessory and makes sence, but the second accessory is much cooler: it's a very beat up and aged version of the 200x Power Sword. While the original intention for the 200x line was that Skeletor had both halves of the Power Sword and He-Man had to use a sword built by Man at Arms and the Sorceress whihc let him tap into the Power of Grayskull, that idea was scrapped in preproduction making the "techno" Power Sword the regular Power Sword. 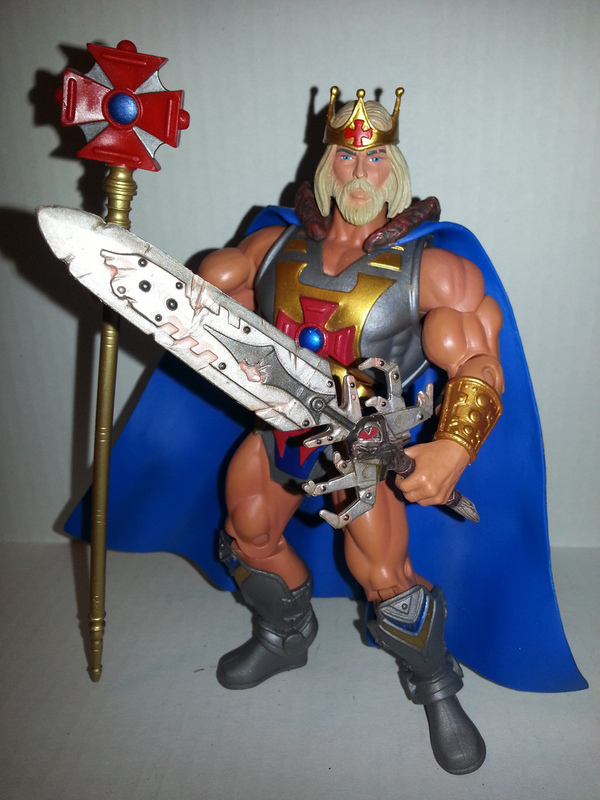 In MOTUC, this sword was built by Man at Arms early in Adam's career as He-Man by Man at Arms and was used before Adam gained the Power Sword. It seems that He-Man has given the real Power Sword to his son, Dare, and has kept his original blade for himself. The blade is truly a work of art from the Four Horsemen: it's rusty, scuffed, chipped, and looks like He-Man has made his own repairs to it such as replacing the handle with the bone of some animal. It's a beautiful accessory that itself tells the story of the many journeys and adventures He-Man has been through. I really like King He-Man. One of the questions that has popped up in the fan community is, "Why King He-Man instead of King Adam?" Personally, I have always seen He-Man as the man Adam is destined to become overtime. While initially there is a radical difference between Adam and He-Man, as time passes Adam grows into He-Man. Many rulers or individuals in special positions of authority take on a name that reflects the type of rule they will have (look at many royal figures or the Pope), thus Adam chooses to go by the royal name of King He-Man, the hero that Eternians have known for so long who will now lead them. In terms of the sword, I imagine that Adam has little need for the Power Sword anymore and has given it to his son, Dare. He keeps his old sword because it was both a gift from his mentor, Man at Arms, and reflects the journey he has undergone in his life. King He-Man is a great figure who really furthers the story of MOTU and shows growth in the character of He-Man. While I would have liked a few minor color swaps and wish the cape was seperate, he still is a great figure. I'm confirming him Great and a 1/2. Barbecue17 is impressed by King He-Man's costume, which isn't hard since his childhood He-Man outfit was two belts around his chest, red shorts, and a pot lid for a shield. By the Power of Grayskull, indeed. Show pity on him and look at his pictures on Flickr.